When coming to the US, immigrants and internationals often find navigating social services to be challenging as they learn about a new culture. Now put yourself in the shoes of an individual who is at the intersection of being LGBTQIA+ and an immigrant or international, and finding available services sensitive and specific to your needs can be even more challenging. Allegra Elson, Director of Instruction at the Greater Pittsburgh Literacy Council (GPLC), has been working with people in these shoes for two decades. One day last year, Elson was asked by an ESL instructor for guidance for an asylee seeking LGBTQIA+ support. When referred to a local LGBTQIA+ service provider, due to lack of cultural awareness, the support provided was off base and the asylee was left directionless. A light bulb went off for Elson, illuminating a need that no doubt has been hidden to many, and for many years. Elson brought her concerns to the Immigrants and Internationals Advisory Council (IIAC) of which she is a member. 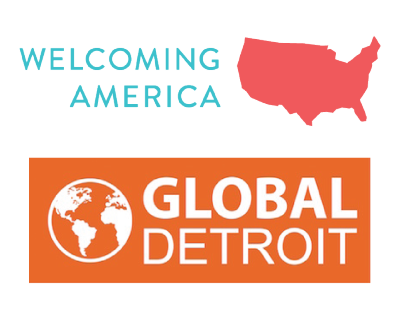 It is a diverse, representative group of immigrant leaders and service providers who advise the Department of Human Services (DHS) regarding the needs of immigrant and international residents. Through further exploration, the IIAC found that referrals to local LGBTQIA+ organizations were not resulting in strong connections to service and support for these individuals as local LGBTQIA+ organizations needed a better understanding of the unique needs of LGBTQIA+ immigrants and internationals. 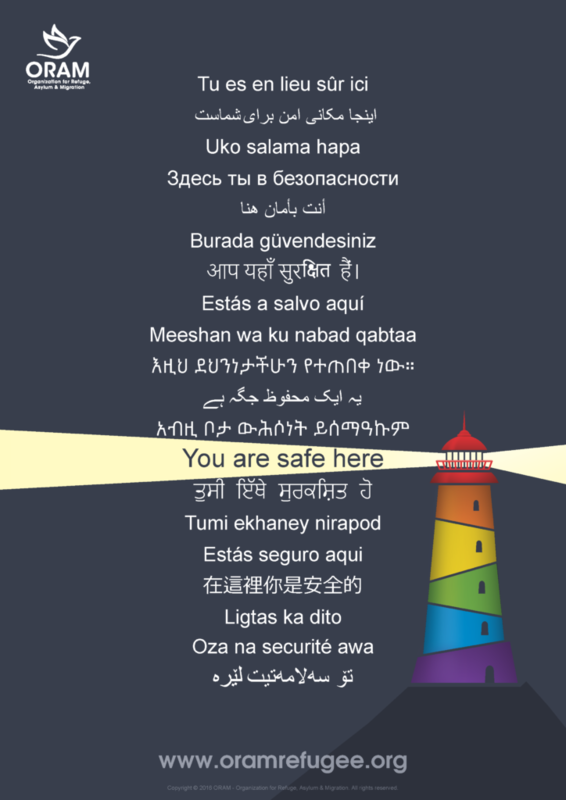 Posters created by the Organization for Refuge, Asylum and Migration (ORAM) for resettlement agencies to hang in their offices to signal cultural sensitivity and welcome to LGBTQIA+ individuals. In January 2018, after surveying both the LGBTQIA+ service provider community regarding their experiences of serving immigrants, and the immigrant leaders and service providers who refer individuals to LGBTQIA+ agencies, Elisabeth Benfield, DHS Immigrants and Internationals Initiative Project Coordinator, led a team in developing a training for the LGBTQIA+ service providers focused on the intersectionality of being LGBTQIA+ and an immigrant or international. This first of its kind training, LGBTQIA+ Immigrants and Internationals: Cultural Considerations, hosted 40 participants from local LGBTQIA+ and service providing organizations. The training was well received and included information on local immigrant cultures and neighborhoods, legal resources, cultural considerations, and utilizing language services. The valuable knowledge garnered at the training was taken back and shared with participant’s colleagues and leaders at their service providing organizations. Evaluation feedback was very positive, many recommending a longer session to expand learning opportunities. According to Benfield, the highlight was a panel composed of four LGBTQIA+ immigrants moderated by Elson, also LGBTQIA+. The panelists’ courageousness and openness to share their experiences as LGBTQIA+ individuals in their native cultures and as immigrants, and speaking to their sometimes unsuccessful encounters with local LGBTQIA+ organizations, provided participants with new understanding and insights on how to improve service provision. 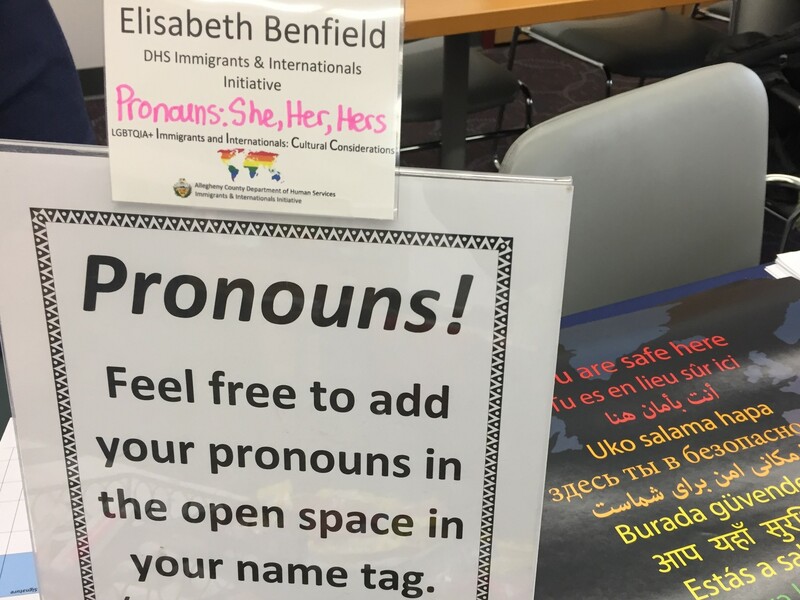 Some background: In 2015, the Allegheny County Department of Human Services (DHS) Immigrant and Internationals Initiative together with the DHS Sexual Orientation, Gender Identity and Expression (SOGIE) Initiative, provided trainings for over 60 refugee and immigrant service providers, case managers and ethnic leaders. These trainings addressed the unique challenges and support needs of LGBTQIA+ immigrants and internationals. Many of the materials were based on resources from the Heartland Alliance International and the Organization for Refuge, Asylum and Migration (ORAM), both national organizations, and resource information was provided for connecting clients to local LGBTQIA+ services and organizations. Cultural sensitivity training is not new. This innovation, however, is a unique hybrid that incorporates the various lenses through which service providers view their work with the many layers present in the lives of the individuals those providers serve. Furthermore, it is sensitive to the fact that all of those layers impact every sphere of one’s life, and the communities to which they are accepted. The effects of this training and its momentum will no doubt extend beyond the finite interactions during service provision and into the broader community of Pittsburgh. The training’s planning committee has decided to continue as an ad hoc committee of the DHS IIAC, with goals to monitor progress, be a resource for both immigrant serving and LGBTQIA+ serving organizations, and to provide further trainings. If you would like more information about either the DHS SOGIE training for immigrant and refugee leaders and service providers (2015) or the Immigrants and Internationals LGBTQIA+ training (2018) programs and outcomes we would be happy to share PowerPoints and resource materials from either. Please contact the Immigrants and Internationals Initiative Manager, Barbara Murock at barabara.murock@alleghnycounty.us.